When Kate Spade isn't designing bags and clothes, she's baking cakes. Forgive me if I spend my vacation days doing boring things like visiting parks. I am a person deprived of huge parks and cool days. Songpa Naru Park surrounds Seokchon Lake. It looks like two lakes but is really just one big lake with Songpa Boulevard (Songpa-daero) cutting across the middle. 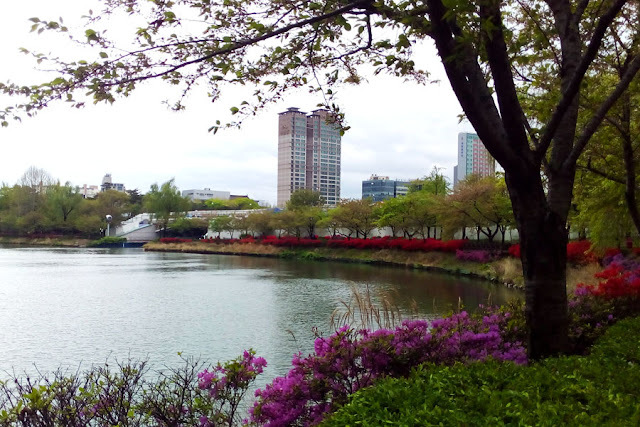 Cherry blossom trees, a jogging path, and a walking trail circumnavigates Seokchon Lake. I got there early in the morning and there were a few people jogging. 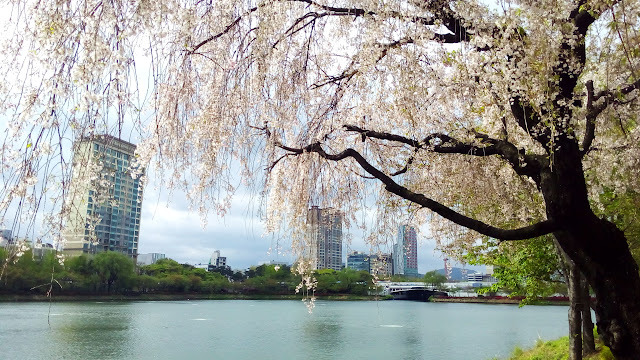 Clutching my small plastic bag of convenience store breakfast: triangle kimbap and yogurt drink, I searched for a spot to have my breakfast and found a bench near the lone tree that had cherry blossoms left on it. A slight breeze was blowing the last of the blossoms away. Songpa Naru Park must have been a beautiful sight just a week back when all the trees were in full bloom. Directions to Songpa Naru Park: Take subway line 2 to Jamsil Station, exit 2. Walk 250m along Songpa-daero Boulevard. 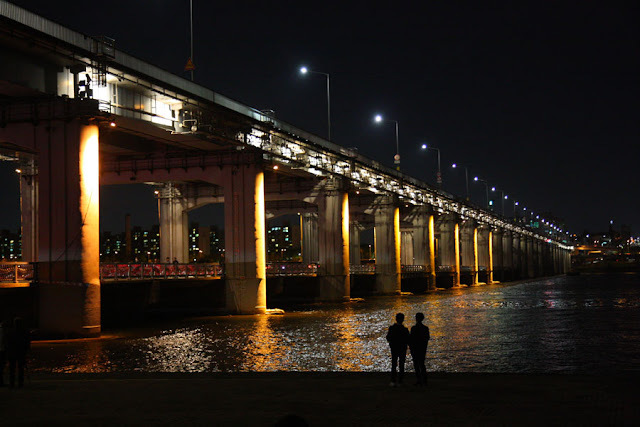 The reason I went to Banpo Hangang Park at night was to see Banpo Bridge and its Moonlight Rainbow Fountain show. The 20–minute show happens four to five times a day, but lucky guy that I am, the show the night I was there was cancelled because it was too windy. As all the other picnickers and photographers packed up and left, I sat around for a bit looking at the skyline across the river. It wasn't long before I was freezing on the concrete bleachers. 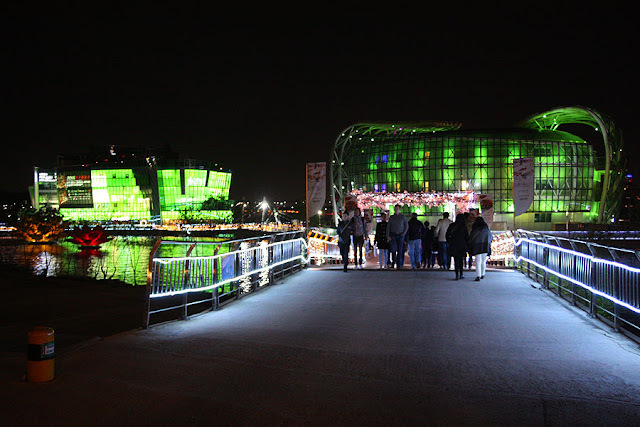 I got up and walked to the other side of the bridge where the bright lights of Some Sevit were and that's the extent of my exploration of Banpo Hangang Park. My bones by then were too cold to explore the length and breadth of the park. Directions to Banpo Hangang Park: Take subway line 3, 7, or 9 to Express Bus Terminal Station, exit 8-1. Go straight for 250m, and turn right at the Express Bus Terminal 4-way intersection. Continue going straight for 400m and cross the road. Go straight through the underpass to arrive at the park. My friend, GaYeong, brought me to Oh Hyang Jokbal, one of the top 3 jokbal restaurants in Seoul. The restaurant is located in an alley near the City Hall and it took us some time going to and fro looking for the restaurant. Jokbal 족발 is pig's trotters or pig's feet. The jokbal in this restaurant is cooked in five secret spices/ingredients that gives its delicious aroma. 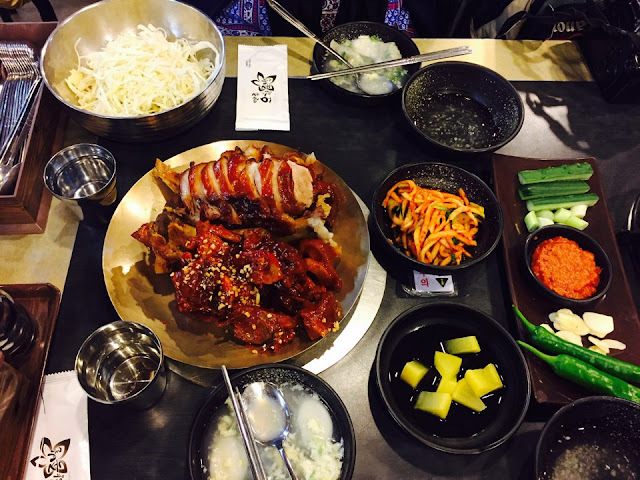 The meat is very tender and is best paired with the restaurant's garlic sauce 마늘소스. We asked for half of the order of jokbal to be not spicy and the other half spicy. GaYeong and I finished every bit of non-spicy jokbal. The other half was too fiery for our tastebuds: one bite and we had to drink a glass of water to put out the fire in our mouths. The jokbal set also came with tteok mandu guk 떡만두국 (rice cake and dumpling soup). GaEun, another good friend of mine, took me to a restaurant known for its noodles. 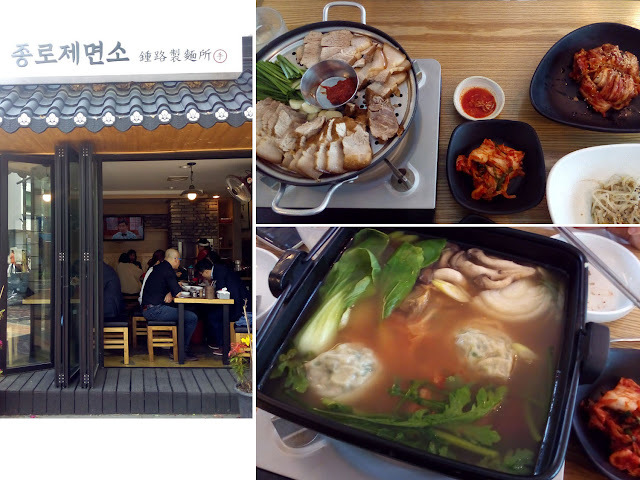 GaEun ordered bossam gwa mandujeongol 보쌈과 만두전골 (pork belly and spicy dumpling noodle soup, KRW 25,000). This was another really good meal! I ate so much and gave up before GaEun did. I think she eats more than I do but she never puts on weight! After watching Nanta! in the Nanta Theater in Hongdae, I followed my good friend, MinJun, through the streets of Hongdae to a restaurant serving gopchang 곱창 (intestines). 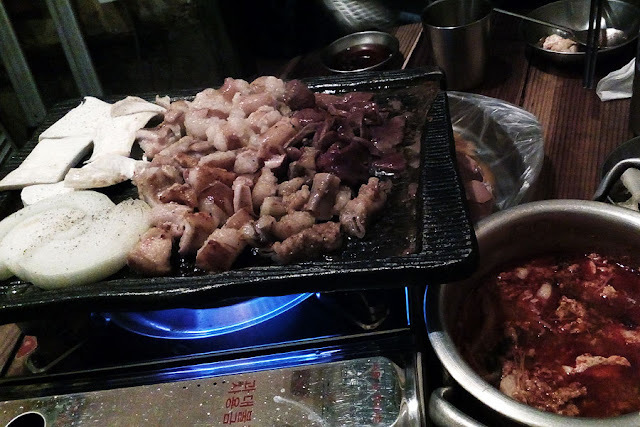 He ordered pork intestines and other offal, and started grilling it all once it landed on the table. In between bites, he kept saying he couldn't believe people ate this stuff! I couldn't believe we finished all of it! I did not take note of the restaurant's name or its address, but if you want to try gopchang, there are many restaurants in Hongdae that serve this. 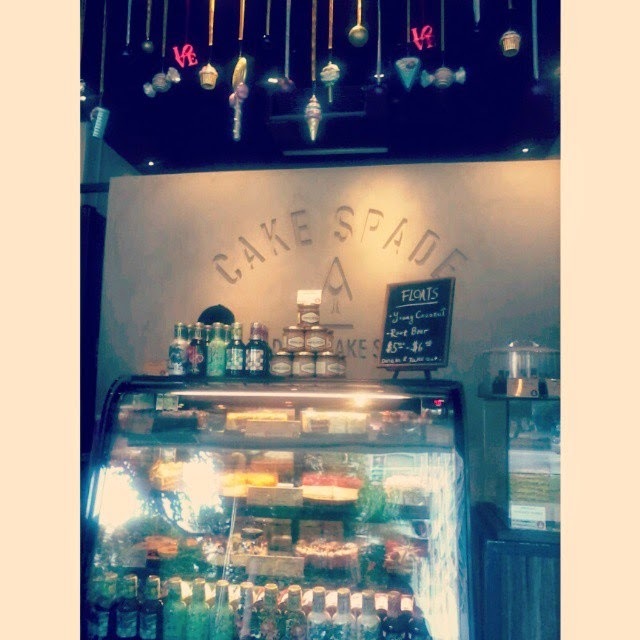 I had read about this bakery and set a goal to find it. My quest was a success and a shock—there was a long line outside the bakery. I did not expect Hyoja Bakery to be that famous. I had half a mind to turn back and leave, but the other half argued that I had walked a long way just to find it. In the end I fell behind the long line of Koreans and waited my turn. 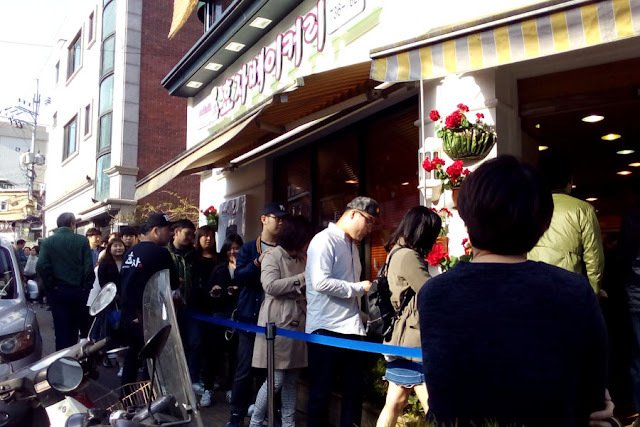 The wait wasn't so bad; one of the bakery workers would walk down the queue and give out samples of their bestsellers. 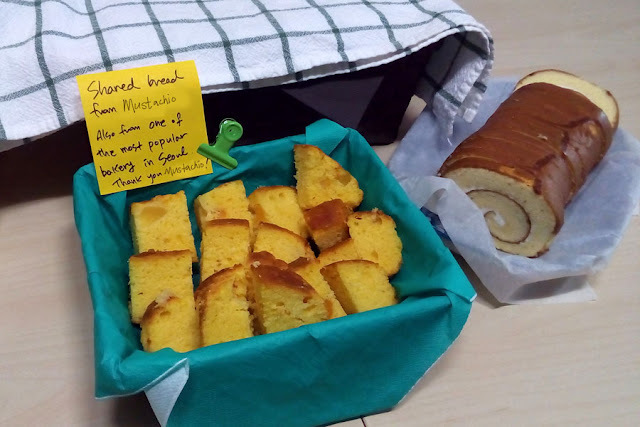 I was the only one that did not look Korean and he asked where I was from, then helpfully enumerated and explained in English what their five bestsellers were: corn bread, onion cream cheese, blueberry cream cheese, bread with tteok (rice cake), and bread with fruits. My breads got squished when I got home. 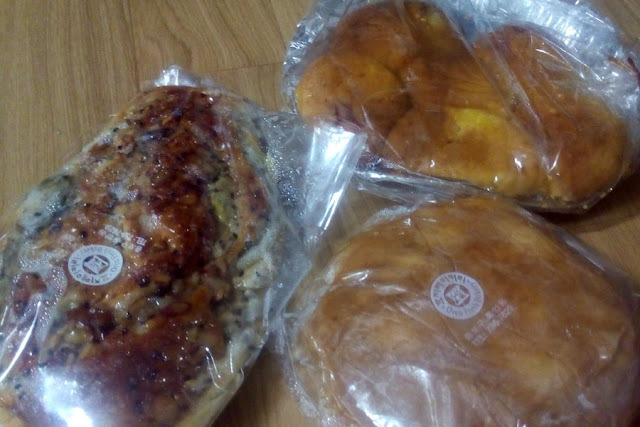 Clockwise from top: corn bread, sweet bread with fruits, bread with tteok. I planned to buy one of each of their bestsellers but when I got inside the bakery, I was in for another surprise. Their goodies were either too big or sold by half a dozen. I decided to buy three of the five bestsellers even if I knew I wouldn't be able to eat all of it. I figured I could share it with the other guests at the guesthouse I was staying in (Kam Guesthouse). Of the three I bought, I liked the corn bread best. It wasn't your ordinary corn bread; aside from corn, it also had onions, mushrooms, and bamboo shoots. I like tteokbokki 떡볶이 (rice cakes). But I have only tried tteokbokki cooked in gochujang (red chili pepper paste). When I found out there was a tteokbokki street that had tteokbooki cooked in a variety of ways, I added it to my itinerary. What I didn't know was that the restaurants in this street only served food good for three to four persons. All I could do was walk down the street and look at every photo on the restaurant glass walls with my stomach grumbling. The woes of traveling alone in South Korea. When preparing for a trip or during the trip itself, do you go crazy combing the internet for suggestions on what to see and do? You can keep your sanity in check with GPS My City app, an app containing thousands of articles for over 600 cities around the world. The mobile app itself is free and is published both for Android and iOS. For a minimal amount, you can upgrade the app to gain access to GPS guided travel articles with an embedded high resolution map pointing out the destinations mentioned in the article—plus GPS navigation assistance! The best part? You don't need the internet to read the article and use the maps. With this app and your map reading skills, you will never get lost. No WiFi? No Data Plan? No problem. I initially planned to stay in one of the guesthouses I had stayed in in 2012, but then I found these inexpensive guesthouses with pretty good ratings on Booking.com. Directions: Take the subway to Gajwa Station (Gyeongui-Jungang Line), exit 1. Kam Guesthouse is a small guesthouse with only two 6-bed dorm rooms (one room for males, one for females) and a one–bedroom apartment. WiFi is available throughout the guesthouse. The dorm rooms have a locker that can fit a backpack. Each bed has a power outlet. Each dorm room has its own toilet and bath. Towels, soap, and shampoo are provided. The rooms and toilets are cleaned daily. You can also use their washing machine for a fee. Breakfast of bread, jam, butter, biscuits, juice, tea, and coffee is also provided. Exit 1 of Gajwa Station is just across the street. Hongdae, a university area filled with cafes, clubs, and shops, is just a 3-minute subway ride from Gajwa Station (the line that runs from Gajwa Station to Hongik Station runs every 15 minutes). Room and toilet are clean. The guesthouse is located in a quiet neighborhood. Prior to the trip, Kani, the owner was very responsive to queries. Kani is very friendly and spends time to chat with her guests. Kani is accommodating. My flight was delayed and I had to check in early in the morning, instead of the previous night, and she welcomed me even as she was rubbing off sleep from her eyes. 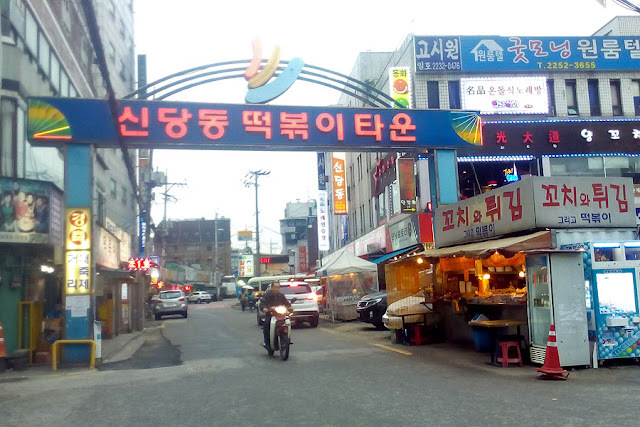 Although Kam Guesthouse is very near Gajwa Station, the line that runs through Gajwa Station to Seoul Station only comes every hour. Directions: Take subway line 4 to Seoul Station, exit 12. The Airport line, Gyeongui-Jungang line, and Line 1 also go through Seoul Station, but I am not sure if these lines have access to exit 12 from underground. 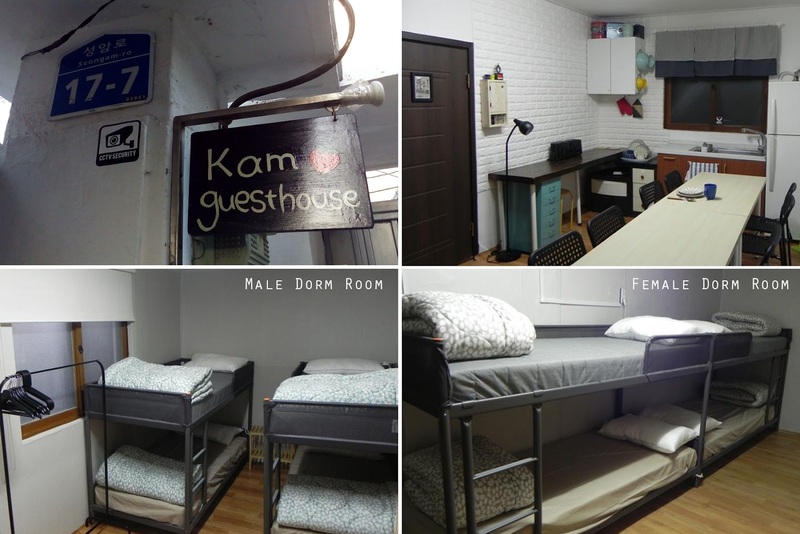 Aroha Guesthouse has dorm rooms and private rooms, but none of the rooms have an ensuite toilet and bathroom. Towels, shampoo, and soap are provided. Breakfast of cereals, bread, jam, butter, milk, juice, coffee, and tea is provided. There are PCs and a TV in the common room. There is also a washing machine available if you need to do your laundry. WiFi is available throughout the guesthouse. 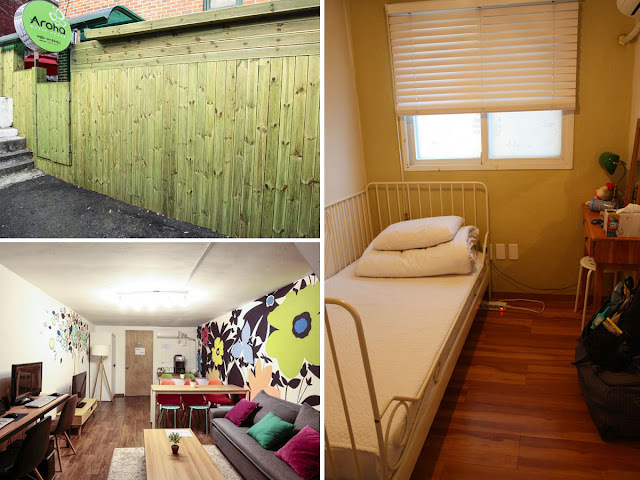 Aroha Guesthouse is just a 3-minute walk from exit 12 (Subway line 4) of Seoul Station. Room is neat and clean. Provided clear instructions on how to find the guesthouse. I stayed in a Single room and an extension wire was provided which allowed me to recharge my gadgets at the same time. If having your own toilet and bath is important, then this guesthouse is not for you. None of the rooms have an ensuite toilet and bath; there are 5 T&Bs shared by 17 rooms. Clockwise from top left: Entrance, Single Room, Common Room. The two photos on the left were taken from their Booking.com page. On the map below, I have pinned all the places I have stayed in, including the three guesthouses we called home in 2012. I did not include the Airbnb accommodation near Seoul Station that I stayed in in 2014, because that's not on the Airbnb listing anymore. Living in the Philippines more years that I can count on my fingers and toes, I don't remember ever being concerned about the weather. It was either sunny or rainy. Either way, I can go out in shorts, shirt, slippers; just bring an umbrella when it's the latter. Knowing the weather forecast climbed 10 rungs up my to-do ladder when I started traveling. But sometimes, old habits die hard, and I simply take the weather for granted. I figured I'd leave my waterproof hooded jacket in the hostel because it looked sunny and, the day before, it was just light rain. That was my basis for the decision. I did not bother to check the weather forecast. The day went on fine without the need for the jacket. It was at night, when we were leaving Beijing 798 Art Zone, the bus stop still miles away when it started pouring cats and dogs. (The bus stop was maybe just one mile away, but seemed like 10 miles when caught in the rain.) It was either run like The Flash or find shelter. We decided on shelter and waited an hour or so for the rain to calm down before venturing out to the bus stop. On a spring day in Seoul, I checked the weather forecast and the temperature. It would be sunny with a temperature of 13°C. I wore a light jacket. The wind blew throughout the day and I was shivering whilst shuffling along the streets. I had neglected to check for winds, gusts, and real feel temperature.